The earliest wellknown master-painter of Kolhapur was Abalal Rahiman who was popular as Abalal - master. The exact date of his birth is not available, however according to the elderly people of Kolhapur it was possibly between 1856 to 1860. His original name was Abdul Aziz. He was born in a family which was wellknown for a tradition of making very artistic manuscripts of Quran. Naturally the seniors in his house knew Farsi (Persian) very well. Abalal was good in drawing and so helped his father in decorating the pages of the manuscripts. Abalal had the schooling upto sixth standard and so knew English very well. He was sent to Mr. Parasnis who was expert in Persian language to learn Farsi. Abalal's father requested to spare some time to teach him, he agreed that when he go to the British Resident's place to teach them Farsi, Abalal can accompany in the bullock cart while going and coming back to learn Farsi. While Mr. Parasnis was busy in the house of the resident in teaching, Abalal use to make pencil drawing sitting in the bullock cart. One day the residents' wife saw Abalal making a drawing and asked the boy whether he would draw her portrait. Abalal readily did it with her full likeness. The lady was so pleased that she showed the portrait to her husband and requested him to do something for his further education. The resident persuaded the Shahu Maharaja to give him a state scholarship for joining Sir. J. J. School of Art in Mumbai. Thus Abalal was sent by his father to Bombay to join Sir. J. J. School of Art. Abalal was very much pleased with the atmosphere in the Art- School and with full devotion and sincerity he tried to learn. The J. J. School of Art Curriculum gave importance to drawing. Naturally Abalal was trained to handle pencil, crayon and charcoal very well. After the teachers approved that he had mastered the drawing and shading, he was allowed to learn the water colour rendering and the oil painting technique. Thus Abalal completed the course in 1888. Abalal achieved many prizes including the one for which he won the Governor's Gold Medal for his set of black and white pictures. Out of these two pictures are still preserved in the collection of Sir. J. J. School of Art, which show the head studies of a lady. In both the pictures the shading is done minutely and with sensitive line work. After completing the art-education Abalal came back to Kolhapur . The Shahu Chhatrapati appointed him as a court painter. The Maharaja took him wherever he went and even for the hunting parties in the Radhanagari Jungle, at Dajipur as well as to the hill stations. Abalal could not adjust with his father and step-mother. He wanted to be free to paint from nature. His most favourite spots were Kotiteertha Lake and the Sandyamath. Abalal made innumerable paintings of these spots. He even painted the pictures of the same spots at various timings to study the effect of sunlight. Abalal's mind was never in the services of the court though he loved the Chhatrapati so much. Chhatrapati Shahu, could understand his mind and allowed him to freely go anywhere and continued his payment from the Darbar. Most of his landscape are of small size, some are even 1/8 th imperial paper size. Though Abalal was expert in handling various techniques, his favourite medium was water colour. His paintings show the appropriate effect of the sunlight and environment. Abalal was a fan of natural beauty. He painted many landscapes. He also painted few portraits. These are either half portraits busts or full size portraits. Out of these one portrait of his sister in law while sewing a choli is very famous. The other one is printed on the book ‘Ranga Chitrakaranche' (Marathi) by author Shamakant Jadhav. Both these paintings show beautiful rendering of the complexion of the figure as well as the drapery- i.e. a nine yard saree of old fashion. 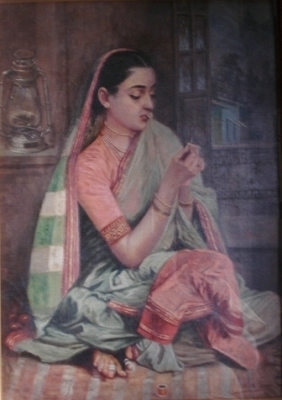 Abalal's painting are in Kolhapur Palace collection, the collection of Dr. Kate ( Kolhapur ) and many private collections. Abalal was very generous and if anybody requested him to give his painting, he readily agreed without expectation of any money for it. So in Kolhapur his paintings will be found in several private collections. Many painters of Kolhapur took inspiration from him including famous painter Rao Bahadur M.V. Dhurandhar. Abalal remained a bachelor for the whole life or we can say he had no interest in the luxurious of the material life. He was only interested in painting the beauty of nature. Abalal also painted the stained glass windows and doors of the Darbar hall of the New Palace, Kolhapur. The Town Hall Museum at Kolhapur has one still life by Abalal; as well as the landscape of the Mosque at Bijapur. Both show expert handling and freshness of colour. Abalal had a great respect and loyalty for the Chhatrapati Shahu of Kolhapur. The death of Maharaja was the great shock to him. In the fit of sorrow he threw many of his paintings in the river Panchaganga. After that he lost all interest in painting. Abalal died on 28 th December 1931.